After popping up on a few recent compilations including the Balkan Vinyl Colours series and the Acid Futures 2-volume compendium from The Centrifuge, Global Goon marks his official return with an absolutely bonkers new long-player. 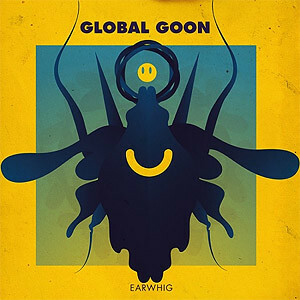 Earwhig, out today and available for free download, meshes Goon's earlier displays of emotional ambient electro, bouncy beats and quirky voices with his latest forays into hard hitting acid house and disco funk. All 9 of the album's melodic braindance tracks feature unique personality and wicked effortless style that only a seasoned IDM veteran like Global Goon could achieve. Can you imagine receiving a disc in the mail packed to the brim with unreleased Global Goon tracks from the past 2 years, and having to select your favorites for an album release? Well that's exactly the task the chaps at Myuzyk faced, and despite the weight of this responsibility, I can't imagine they could have plucked a better bunch. The album kicks off with the sunniest of the lot - "Septagonaloblonged" - a funky, roller disco acid ditty reminiscent of something we might have heard from Kerrier District or Metro Area in the year 2025. But just when you've donned your polyester jumpsuit and laced up your skates, track 2 "Clatterly" starts and the roller rink transforms into a dark, empty warehouse haunted by the ghosts of dead ravers and broken synthesizers lurking about and laughing at you from the 303rd dimension. Though each track surrounds the listener with a new and different atmosphere, you can bank on being met with booming kick drums, buzzy basslines, and playfully tweaked sinewaves at every turn. But the real magic of this album lies within Global Goon's mind-blowing creativity. Most of the tempos are at somewhat of a walker's pace, but his unexpected sound pallets, deliberate use of effects, vocal samples, and his ability to weave melody in and out of complex rhythm keep you intrigued the whole way through. These qualities are what drew me to this genre in the first place, and the release of Earwhig has further ensconced Global Goon within my own personal braindance wall of fame. To coincide with the album release, Myuzyk conducted a fun interview with Mr. Goon in which he reminisces about playing Mario Kart with the Rephlex gang and tells us his favorite joke. Click Here for "Ten Questions For Global Goon". Also, rumor has it there will be another Global Goon album coming out on Balkan Vinyl on 2x12" + digital before the year is up, and if you're in the UK, you can catch Global Goon live in London on October 13th and in Newcastle on November 12th. Updated footnote with additional live date. Thanks! Hey Brainchops! I'm a huge Global Goon fan of old, but have fallen behind the past few years (kids, mortgage etc) So it was pretty awesome to read that there were some free downloads here. Problem is, I can't get any of them to work! Am I doing something wrong, or have they gone away? Cheers. the same happens to me, i guess it went off... can some one re-up this album for god sake?